The largest garden bed on my property, my back side garden, has long be devoid of a focal point. When I was doing most of these gardens in the fall of 2004 I needed (wanted?) to create a very large bed to balance out the rest of the yard, but whereas I had plants and design schemes in my mind for my other beds, this one was to be experimental, where I put all the plants I wanted to grow but didn’t have room for elsewhere. As such, I’ve changed this bed a lot, I’ve constantly moved things or dug up things, never quite being fully happy with it, but slowly, it is coming around. The most recent change as the addition of my brand new water feature, and I couldn’t be more pleased with the results. I had previously had a little wishing well-like water “feature” in the back of the garden, and it was alright, the brick work was really well done on it, but it was way too small for the space, and it didn’t really add any character, it was too plain, it just didn’t work. I decided to get rid of it, and in its place do something with stone that was larger. I decided to do a larger raised stone water feature. Raised, so I could show off the stone, and so it would be more of a focal point. I tell you what, the second I put those beautiful Three Rivers Stone boulders down in the garden, it all changed. Just the mere addition of stone changed the looked of the garden, it was unbelievable. I’ve never experienced so drastic a visual change in a garden from a single addition. I was obviously missing stone before. The fact is, we garden, usually, to mimic nature, and there are stones in nature, and there are changes of elevation in nature, and this was a big flat garden area. I am now going to experiment with adding boulders to my other garden beds. I was very much flying by the seat of my pants with this design, I had no plans to base it off of, just an idea in my head, and it turned out better than my wildest imaginations. I’ve had some luck in the past with my ideas coming off really well, but normally the first iteration needs work, not in this case, it looks amazing, way better than I had hoped, it cost less than I thought it would, and it helps the garden more than I thought it would. I planted it with sedum ground covers in purple, blue, and red, and with dwarf evergreen accent plants. There are a couple waterlilies in the water, as well as a plant for the fish to nibble on, and yes, there are fish. 6 comet goldfish, which apparently can indeed live in there year round so long as it doesn’t freeze solid. 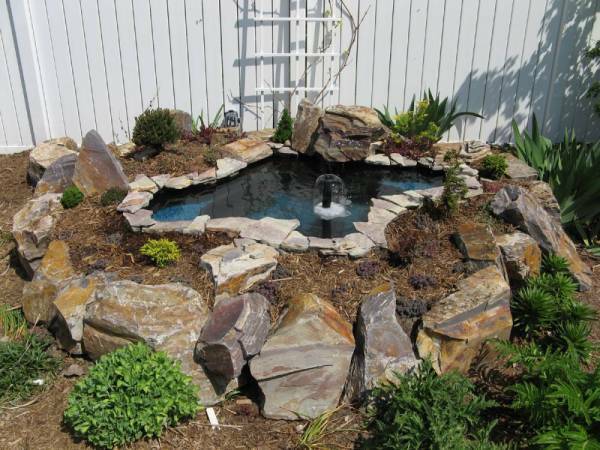 I’ve posted instructions on how to make such a water feature as well as more pictures of mine. It so nice to finally crack a flower bed. I have had an area that has annoyed me for ages but I moved a small tree in to it and it just lifted the whole area. Great pond! I’m looking at putting one in myself, and this has just given me the inspiration to go bush and find some rocks to use as edging. I was going to dig a hole for it, but the raised look is fantastic! Wow that looks really good – I have been very intimidated by stone but now am thinking hmm…it would look so good out front in a few strategic places. Thanks for the photos/tutorial & inspiration! AWESOME tips on what one needs for a sufficient filtratio system will make all the difference in the world for a successful pond and water garden! Oh my gosh you are so right about filtration systems. My 6 year old grand daughter put the fish she won at the fair in our backyard water garden, and Grandma killed it! My granddaughter was in tears until I checked out the website you recommended and found even more helpful hints. Give it a shot! Great landscape you have there, it is really nice to have such awesome pond at home. Your garden water feature looks awesome, I have used sandstone and timbers to create a natural look with mine. I even managed to create a small waterfall that flows over some rocks into the pond using an old bath as a reservoir camouflaged with reeds. I love your fountain setup. Nicely done, really like the river boulders which set it off well. The water looks very clean too which is a bonus – just difficult to keep it that way! Ponds always look good in a garden. The fountain head will keep the water clear as long as you keep it running. Looks very natural, which is a style that is often now overlooked. Well done! A very natural looking water feature! A great looking water feature – if you can do this by flying by the seat of your pants then can I recommend a career in water features!